Organised by the team at The Slow Cyclist in partnership with Charity Links, this 8-day challenge will see a group of 25 intrepid cyclists take on a guided, fully-supported cycle, starting near Kenya’s capital Nairobi before journeying south to the soda lakes of Magadi and onwards to the heart of the Great Rift Valley before finishing in the wildlife-rich plains of the Maasai Mara. Hosting the ride will be John Douglas and Oli Broom, founders of Charity Links and The Slow Cyclist respectively, accompanied by a fantastic team of local guides, cooks and drivers. All have their own skills and interests that are bound to leave a lasting impression long after you have conquered the Great Rift. Your flight arrives early this morning. You will be met by our local team and driven approximately 2 hours to Lesiolo Resort, where we will spend the night. After lunch and a bike fitting we’ll go for a gentle, short ride to Olooseos Girls School. There we’ll begin to learn about the Kenyan education system. Sundowners this evening will be at the home of David Debenham, who runs one of our partner charities. Late afternoon Visit David’s farm for sundowner return back to Lesiolo Resort for an early dinner and early night (lunch and dinner included). Today’s ride begins at 2,400 metres and is mostly downhill until the end of the day, on the shores of Lake Magadi, a soda lake that sits at 900 metres above sea level and is famous for its flamingos. On the way we will visit the Olorgesaille prehistoric early man site and have a bush lunch. Overnight is spent at Magadi Tented Camp. This morning we travel by narrow gauge railway from Magadito Kajiado (4.5 hours). The carriages were previously used to transport rail workers but they will make for a comfortable and unique experience for us today. Upon arrival in Kajiado we will jump in vehicles to be driven back to Lesiolo. If time allows we will hike in the beautful Ngong Hills before sunset. 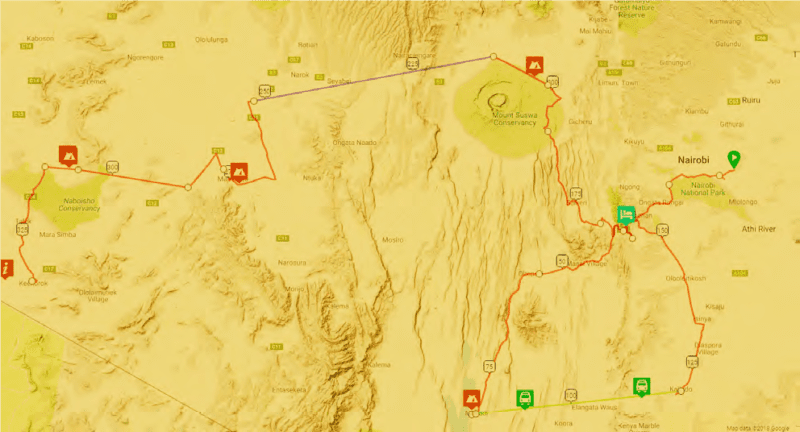 After a transfer to the edge of the Great Rift Valley, we cycle 65 kms through the bush, mostly downhill (from 2,400m to 1,700m) to our overnight fly camp at Suswa, a remarkable volcano, virtually untouched by the outside world. Dinner is around a camp fire with the magical sounds of Africa reverberating around us. It’s a very early start today, and a beautiful 8 km cycle to the main road, where we jump in trucks for a 2-hour transfer out of the Rift Valley to the Maasai Mara. Around mid-morning we will be back on the bikes, pedalling across the Mara’s plains and keeping eyes peeled for zebra, impala, wildebeest and much more! Our evening is again spent around a campfire. 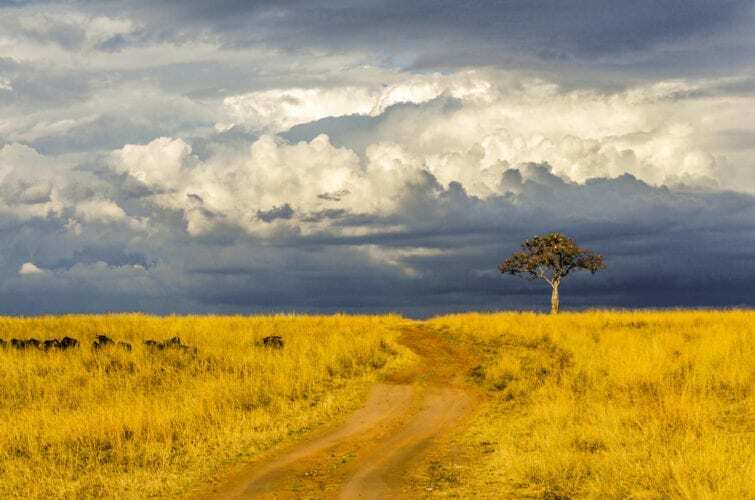 Today is a spectacular ride, along narrow trails some of the way and heading deeper into the Mara with every pedal stroke – so again, keep your wits about you! It’s another night camping under the stars in the Maasai Mara. Today is our last day on two wheels as we pedal across the Mara on dirt roads and tracks to our lodge. We will have time to settle into our rooms before lunch and an afternoon game drive. On Friday it’s a morning game drive followed by transfer back to Nairobi, and dinner out in the city (dinner not included). The following day the group will begin to head home, but for those still around we will visit a giraffe centre and Sheldrick’s elephant orphanage (lunch and dinner not included). Do I need to provide my own bike? No. You will be cycling on and off-road throughout your trip, and the mix of terrain means that a hardtail (front suspension) mountain bike is the best tool for the job. The team at The Slow Cyclist will provide you with a bike on arrival in Kenya. The cost of the trip includes: airport transfers, all support (including vehicles), accommodation and meals, English speaking host and guides, daily activities, bike and helmet hire, and 100% financial security. There is a single person supplement of £250 only if you want a private room and do not want to share. The cost does not include: flights, snacks, travel insurance and entry visas, and other personal expenses. Who are Charity Links and The Slow Cyclist? Inspired to take on the challenge..? There are limited opportunities to join this trip – which would include the opportunity to visit our projects before or after the ride – with 50% of what you raise supporting our work and the remaining 50% being split between the other partner charities. To register please complete the booking form on The Slow Cyclist website via the link below. You will be required to pay a 30% deposit at the time of booking to confirm your place. If you have any questions or need any help with the registration process please do not hesitate to get in touch.